Here is our Used Auto-Sleeper Nuevo EK 2 Berth Automatic 2015/15 Plate. 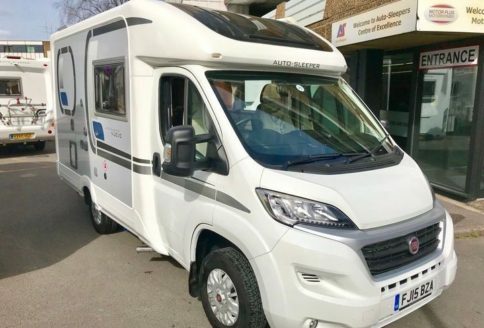 The Nuevo is a popular, compact 2 berth Auto-Sleeper model. So, they usually get snapped up quickly and having checked, this is the only used example currently available. 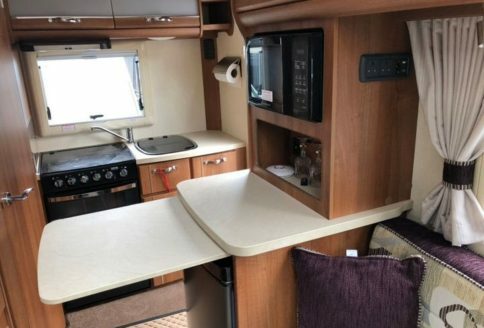 The Auto-Sleeper Nuevo EK (end kitchen) is a low-profile, front lounge, rear kitchen, compact coach-built motorhome. This Nuevo was registered in April 2015 and has only covered just 6,800 miles. The ever-popular, compact 2-berth Nuevo EK has a very impressive specification. 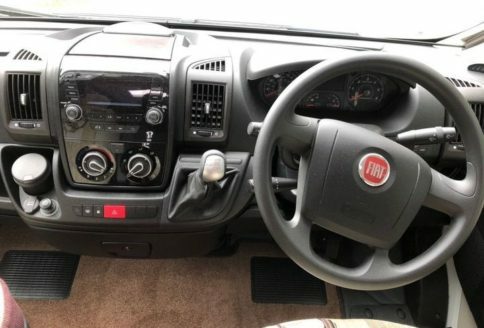 This is an automatic and has cab air conditioning, cruise control, radio-cd player, electric windows as well as alloy wheels. Habitation features include a refillable gas tank, solar panel, microwave oven and safe. The engine, by Fiat, is a powerful 2.3 turbo diesel and features their “Comfortmatic” automatic gearbox. Driver specification includes electric windows and mirrors, a colour reversing camera and adjustable steering column. The Nuevo also has removable cab and habitation carpets as well as swivelling cab seats. Finally, this Auto-Sleepers Nuevo EK has an electric step, awning, TV aerial and rear steadies for added stability when parked. 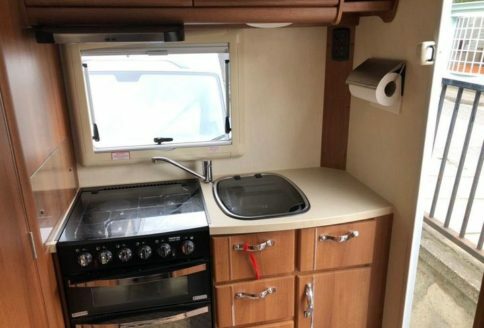 This Used Auto-Sleeper Nuevo EK 2 Berth Automatic 2015/15 Plate has a very good kitchen. Thus, it features a full-size cooker with 3 gas burners and 1 electric hot-plate. Hence, it also has a good, large oven and grill also. Above the fridge-freezer, you will find the dual-zone microwave and even an electric cooker hood above the cooker too. So, it also has lots of useful high-level lockers and lower cupboards also. The shower room features a space-saving swing-wall sink unit incorporating a mirrored storage cabinet. 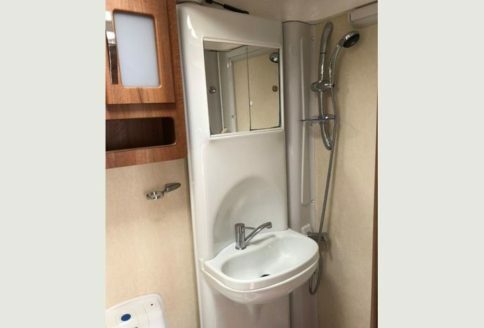 It also has an electric flush cassette toilet and shower. The Nuevo has “Truma”, gas/electric warm-air heating which is also ducted into the shower room. The lounge features 2 opposing sofas. Thus, these convert into either singles or a double bed. It has an opening ”Sky-View” window over the cab. The Nuevo EK features a comfortable lounge with 2 sofas. Both cab seats swivel for ease of use and comfort. There is also a small pedestal table for use between the cab seats. It has storage below each sofa base and the passenger-side is all free space for storage. There are ample over-head lockers with reading lights below and large windows provide lots of light. As standard, in the lounge, is an overhead “Heki” window and 2 TV plug-in points. Furthermore, all windows and roof vents have blinds and fly-screens. Outside our Nuevo has an awning and light, a gas bbq point and an electric step too. Thus, for outdoor living, you can be very comfortable. On the roof is a TV aerial and an external TV point on the side. Finally, the Nuevo EK has colour a coded front bumper and a refillable, 20 litre gas-tank. 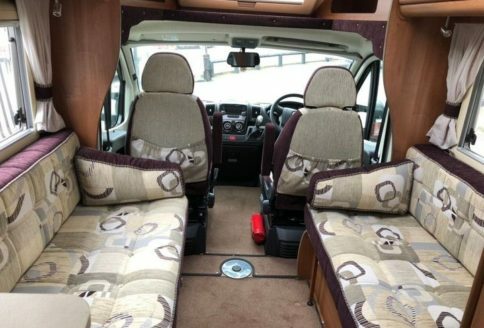 Our Auto-Sleepers Nuevo EK automatic is a very rare and extremely desirable motorhome for sale. We welcome part exchanges.